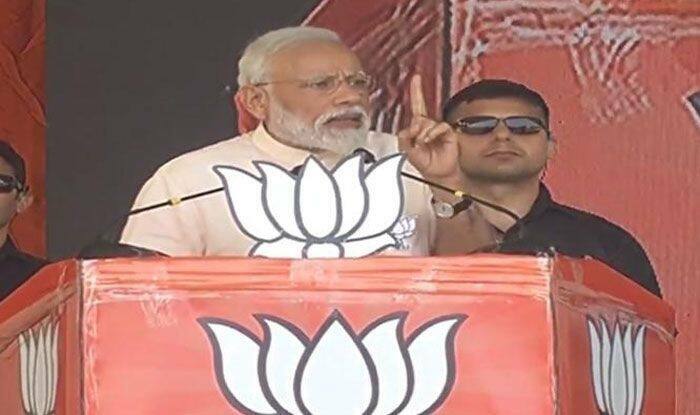 Narendra Modi, while speaking at a rally in Wardha, also said Congress leaders no longer have the courage to contest the polls from places dominated by Hindus. Prime Minister Narendra Modi on Monday launched a broadside against the Congress, accusing it of branding “peace-loving Hindus” as terrorists and insulting those who follow the religion. Launching the BJP-Shiv Sena alliance’s Lok Sabha poll campaign in Maharashtra at a public rally in Wardha, Modi said the Congress coined the term ‘Hindu terror’. “Leaders of that party are now scared of contesting from constituencies dominated by majority (Hindu) population,” Modi said. “Congress used the term ‘Hindu terror’…it labelled the peace-loving Hindus as terrorists…is there a single incident of Hindu terrorism?” Modi said. “Congress insulted Hindus…people have decided to punish it in election…hence, it is scared of fielding candidate from constituencies dominated by majority population,” Modi added. This was because the NCP chief sensed an unfavourable situation, Modi said, taunting the latter for “shying away” from poll fight. Modi also claimed there was a family feud in the Pawar family and that Pawar was losing his grip on the party. Modi also termed the Congress’ “abuse” that he was a “chowkidar of toilets” as an “ornament” for him. He congratulated ISRO scientists on the successful launch of EMISAT satellite onboard polar rocket PSLV-C45 from Sriharikota.